We are producing a mini magazine featuring a local art trail, and highlighting recreational spots along the Tutukaka Coast. There is a mapped guide to artist studios and galleries, info from local shops, cafes, restaurants, hardware and gardening suppliers, trades, services and summer activities offered along the Coast and some artful ideas & links to Whangarei too. The Coastie Summer Edition will be around from 18th December until beginning of February, replacing our regular weekly issue for that period. 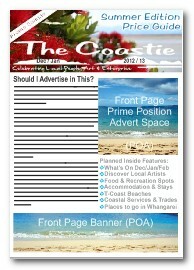 Anyone wanting to advertise in this special issue - please contact us for distribution info, print run details and advert pricing by email thecoastie.nz@gmail.com. We've had fabulous response so far so it's all go.